One of the main two gulag memorial sites in Kazakhstan (the other being KarLag at Dolinka near Karaganda), a complex of monuments, sculptures and, most significantly, a modern memorial museum. For the dark tourist this makes for a very worthwhile half-day excursion from Astana. More background info: the cryptic acronym ALZHIR (pronounced just like the capital of Algeria) stands for the Russian for "Akmolinskiy internment camp for the wives of the betrayers of the homeland". This was the particularly Stalinist gulag for wives (and children) of political prisoners who were deemed traitors. The wives were simply considered as guilty as their husbands by association. The German language has a concise word for this: "Sippenhaft" – which only lamely translates into English as 'clan liability' or 'collective punishment' (although it has elements of both). It wasn't exactly an invention of Stalin's (Hitler did it too), but he practised it possibly more ruthlessly than anyone during the 1930s purges and during WWII. The camp was in operation from the 1930s through to the early 1950s (more precise figures claim from 1937 to 1946) and was one of the most notorious camps in central Kazakhstan – not just because of its special role as a women's camp within the gulag system, but also because it had several high-profile prisoners, including artists and actresses. Living conditions were just as harsh as in any gulag. Accommodation was in the form of wooden barracks with as many as 400 bunk beds each. Food rations were meagre (porridge, cabbage and potatoes the only regular staples). The forced labour the women had to perform consisted of sewing army uniforms, raising livestock, other agricultural tasks and even construction work. Winters were particularly horrific, given the totally inadequate protection from the cold that the inmates had to make do with. Hardest for most, however, was the fact that they had been separated from their loved ones – not only husbands (who were considered the actual traitors and often sent to other gulags as far away as eastern Siberia, never to return …) but also from their children. Young children of so-called "betrayers of the homeland" were frequently taken from their mothers for good and given away for adoption. Despite the cruel framework of the ALZHIR camp, commanders and guards were not necessarily as brutal and heartless as one automatically assumes in association with such camps, but, aware that none of these women had actually committed any real crime, were quite sympathetic towards them. So, at least, some ex-inmates apparently reported later. The ALZHIR memorial museum at Malinovka was opened as late as 2007 – by President Nazarbayev himself – and is a fairly modern affair. The outdoor part has since been expanded, and now incorporates the Memorial to the Victims of Political Repression, recently relocated here from Astana (where it used to be located just south of the City Park). For instance, the introductory film shown to visitors on arrival at the museum makes the claim that the Soviet Union was the only country ever to have done this sort of thing to its own people – and a contrast to even Hitler's Germany is being insinuated. This is bizarre, as Hitler, too, directed his reign of terror not only against outside enemies but also against his own people – not least the German Jews! – as well as the political opposition … and that in a manner that is in fact quite similar to Stalin's repression of his people. And what about China? Chile? Argentina? Not to mention the downright autogenocidal terror of the Khmer Rouge in Cambodia … all directed internally too. The role that Kazakhstan has assumed in aiming to come to terms with its gulag history is a bit over-celebrated here too. Granted, Kazakhstan is addressing this noticeably more head-on than any other of the former Soviet republics, most significantly Russia. There are a couple of gulag memorial sites in Russia, too, though – see Perm 36 and the Gulag Museum in Moscow – but these do indeed not enjoy the same state endorsement and financial support as the ALZHIR and KarLag memorials do in Kazakhstan. So it is in fact commendable that Kazakhstan is trying to do more in that direction, but harping on about it in self-praise leaves a somewhat bitter aftertaste. It's just a little uncomfortably out of balance. If they think their commemoration efforts are so good, why not let them speak for themselves? One reason may be that while the museum is well prepared to receive foreign visitors, its main clientele remains home-grown. When I was there, exploring the outdoor parts of the complex after having been to the museum, a huge horde of visitors suddenly arrived in about a dozen buses: these were female Kazakh soldiers, obviously on a collective visit organized as part of their military training, or rather: the "political teaching" part of it, one may assume. In a way, then, this makes the liberal dose of propaganda in the museum's commodification of its subject matter a little more explicable – though no less problematic. What there is to see: as you arrive at the large car park of the this recently opened memorial complex (just four years old and still looking brand new), you see the dominating features of its conical museum building (see below) and a central arch memorial. The latter is called the Arch of Sorrow (or "Arch of Grief", as the Bradt guide has it, contrary to the sign at the site itself) and is a rather surprisingly shiny metal piece of art, very modern in appearance. An outer silver metal grille dome holding in a solid black smaller dome, both stretched up high and with a tall open arch to walk through. A ring of round mirrored panels running around the structure towards the top are vaguely reminiscent of a space ship out of a children's story. Allegedly, however, its design is supposed to allude to a typical traditional Kazakh head-dress for women, but you'd never guess (maybe because of the size of the structure alone!) A sign at the base of the monument admonishes you to "duck your head to pay tribute the victims of political repressions!" (sic!). To the left of the Arch stands a more realistic monument: a railway carriage of the typical cattle wagon type used in deportation trains (cf. concentration camps, Drancy, USHMM). Steps lead up to a little platform from where you can peek inside. There's a small coal-fired oven in the centre and a panel on the rear wall. The top of the latter shows a (rather naïve-style) drawing of deportees standing in such a carriage, and below is a reproduction of a photograph of a group of new arrivals at the camp. To the left and right are two-tier bunks, each with a solitary dummy deportee. The one to the left looks suitably dejected, wearing a headscarf and lying slumped to the side as if sleeping (or already dead?). The one to the right, on the other hand, looks just a little too upbeat and well-dressed for the occasion (with a classy hat, jacket and silk scarf), as if taken straight from a clothes shop window. A few yards beyond stands a small mock wooden watchtower as if to underscore the actual theme of the site. On either side of the plaza in front of the museum entrance are two sculptures. The one on the left is called "Despair and Impuissance" (if you'd need to look the latter word up, like I had to, then let me inform you that this rare lexical item is apparently a French loan word meaning 'powerlessness'). The statue is of a bronze man sitting dejectedly on a small stool, arms dangling by the side, head bowed down defeatedly. Opposite him, to the right of the plaza, the other sculpture has a more uplifting character. It's called "Struggle and Hope" and is a bronze (rather big-footed) women sitting on an upturned bucket, cross-legged and chin propped up on her right arm, while the left hand is loosely holding a small book to her side. She's gazing into the distance, as if in silent, but optimistic contemplation. To the side of the museum is a large marble slab with a trilingual commemorative inscription. Unfortunately, it includes a couple of embarrassing spelling mistakes in the English, which rather deflates the poetic aloofness. There are further marble blocks with inscriptions honouring victims of various nationalities, in their respective scripts (e.g. Georgian). Inside, a huge central atrium opens up. At its centre is a monument consisting of a plied-open pyramid with roses emerging from the apex, while a swirly wire-mesh sculpture hanging from the ceiling has a few wooden doves inside it that look as if they're caught in a whirlwind updraft. The museum exhibition as such is arranged in circles around this central space, on two levels. This is one of the few museums in Kazakhstan that is really geared up for receiving foreign visitors too. The labelling of exhibits is trilingual (Kazakh, Russian, English) and guided tours in English are available. The translation quality of the English labelling is often rather shaky, but OK enough to give you a sufficient idea, while retaining the over-poetic style of expression typical of Russia and the East in general. The guide spoke somewhat strained but decent enough English in pleasant delivery. My visit coincided with that of a small group of international tourists, including from Great Britain and the USA. In fact this was the only time I encountered other Western tourists during my three-and-a-half weeks 2011 tour of the country! So we were lumped together for the film viewing and the subsequent guided tour through the museum exhibition. Unusually, we were allowed to take pictures too (see below). First we were led into a cinema room where a 20-minute video was shown, in Russian with English subtitles, entitled "The Fierce Cold of ALZHIR". This was mainly about the history of the camp and featured eyewitness accounts and/or stories told by relatives of victims, including the reading of letters sent by children to their parents who were imprisoned in the gulag. It's bordering on the tear-jerking, of course. The not exactly neutral tone continues when a lot of emphasis is placed on the special role of Kazakhstan in memorial and remembrance of the gulag history to "ensure this never happens again" (I think we've all heard that line many times before in various other places …). Not all that surprisingly, then, even a short clip of President Nazarbayev speaking also features in the film. The exhibition on the ground floor focuses mainly on background history, as well as on individuals. Many of these, however celebrated individuals in a Kazakh (or Soviet) context they may be, are typically not all that familiar to foreigners (if at all). But their stories, as relayed by the museum guide, are nonetheless touching. Upstairs on the first floor the exhibition gets a little more graphic. Here the focus is on the conditions in the ALZHIR camp itself, as well as the system of repression that led to the victims being incarcerated here. There are mock-ups of women's barracks, an iron bedstead with some straw scattered on it, a sewing workshop, a diorama showing mother nature and labour, and a fully-furnished interrogator's office, complete with Stalin picture on the wall and a Lenin bust on a shelf. A particularly striking exhibit is an artist's installation constructed around an original wooden door from a camp barrack. Around this hands cling on to or reach out through iron bars … and a mirror set against the rear wall emphasizes the portrayal of mass despair. On a smaller scale, there are artefacts such as shackles, little clay dolls made by prisoners and, of course, lots of photos and documents. The latter are in Russian (or Kazakh) only, with no translation provided, but include original court decision documents and: a map of the gulag system all across the Soviet Union. Not quite on topic, there is also a small section about the December 1986 events in Almaty (see also Museum of the President's Cultural Centre), as well as one showing pictures of other memorials related to ALZHIR's. The latter includes a couple of monuments that are located just next door, as it were, namely in the nearby settlement of Malinovka (see below under combinations). These are parts of the older, original ALZHIR memorial. One simply spells out the word ALZHIR (in Cyrillic, of course) and is flanked by a couple of text panels. It's located at the end of the road that leads from the modern memorial complex to the village. Beyond the barrier and just into Malinovka proper there's a second, somewhat more striking monument. This features a large fractured red star, one side of it looking as if it's breaking off and about to fall to the ground – which is pretty self-explanatory in its symbolism. Around it there are yet more text panels. All these are, however, in Kazakh and Russian only. Location: some 20 miles (35 km) south-west of Astana, Kazakhstan, just south off the R-206 road towards Korgalzhyn. The village of Malinovka is these days also known under the name Akmol. Access and costs: out in the country, but not too difficult to get to from Astana, not expensive . Details: you could get there by catching one of the several daily buses that go from Astana to Korgalzhyn and be dropped off at Malinovka/Akmol (it's just a short walk from the main road to the memorial complex). Or negotiate with an Astana taxi to drive you there and wait to take you back (you won't find any taxis in Malinovka). Better still, go with a local tourist agent – excursions to the ALZHIR memorial complex are probably not as exotic as it may sound. I'm sure regular tourist services will be happy to take you there; you could start by asking at one of the better hotels. Personally, I went there as part of a longer organized trip, which also took in parts of Astana and then headed out to the east of the country, all done with an operator based in Karaganda – and if a Karaganda agency can do this, any Astana-based one must be able to as well. Or try Kazakhstan Tours, a specialist Dutch operator/agent that I can recommend – see their sponsored page here. Opening times: Tuesday to Sunday 9 a.m. to 7 p.m. Admission: if self-guided, adults are charged 200 KZT, students pay 100 KZT, schoolchildren 80 KZT, pre-school children, disabled (presumably – the sign says "people with limited possibilities") and senior citizens as well as war veterans get in for free. For our visit including a guided group tour we paid 300 KZT each. The group price list that the museum itself publishes (online) is a bit unclear – it says an individual guided tour costs 250 KZT, while groups are charged differently according to numbers (300 KZT for up to 10, 500 KZT for 10-25 and 1000 KZT for more than 25 … but presumably not per head …). Ultimately, you will just have to pay what they ask you to anyway. Normally there is a no photography policy in place here. Interestingly, however, this rule was suspended for my group of international visitors when I was there in August 2011. At some points in the exhibition we were even positively invited to take pictures! Whether this was a rare exception (and if so, why it was made) I cannot say. It may well be, though, that as an individual visitor you may not be given this privilege (going by other museums in Kazakhstan – see in particular the Museum of the First President in Astana, where the no-photography rule is ruthlessly policed). Time required: the guided tour of the museum lasts ca. 45 minutes. Add to that the 20-minute introductory film, and at least half an hour to view the open-air parts of the memorial site and possibly yet more time to take in the older memorials in Malinovka and a quick look around the village itself. All in all two hours have to be allocated, then, in addition to driving time, which makes ALZHIR a half-day excursion from Astana. Combinations with other dark destinations: Just beyond the older ALZHIR memorial/monuments lies Malinovka village. And if you have the time, it might be an idea to go and have a look here too. This is, however, not tourist territory and you may get some strange looks! The village has a very run-down feel to it. It consists mostly of rows of crumbling old Soviet-style five-storey prefab residential blocks radiating out from around a central square. The latter has at its one end the obligatory war memorial (a simple tall obelisk with a faded red star on top), and on a building to the right a huge clock sits at the top of the facade. 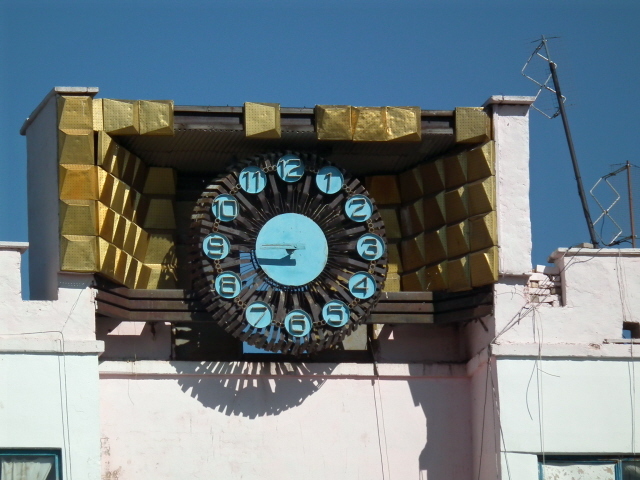 However, the clock has only one hand left – and it's no longer moving. Time stands still here, as it were. And some of the gold tiles around it have fallen off. I found it quite strikingly, if clearly involuntarily, symbolic of the place. Otherwise there isn't much of particular interest to the dark tourist in the immediate vicinity. It's better to head back to Astana for more of that. Combinations with non-dark destinations: none in the direct vicinity; but carry on south-westwards for another 55 miles (90 km) and you'll get to Korgalzhyn, which is 75 miles (120 km) from Astana. This town serves as a gateway to excursions around a nature reserve of the same name, which sports a cluster of lakes (including the large Lake Tengiz) that are renowned for their bird-watching opportunities. Species include pelicans, cranes and even pink flamingos! Otherwise you're best off heading back to Astana and its OTT cityscape that greets you from afar as it rises, like an alien colony, out of the otherwise featureless steppe.